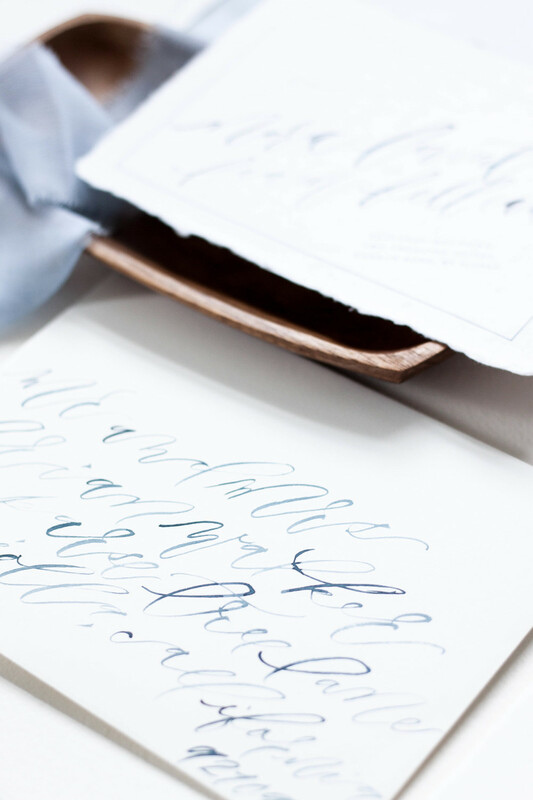 Once we have our sketch finalized and our lettering style selected, we begin creating the artwork that will be included in the invitation suite. It is our goal and part of our business philosophy that we never want a client to feel limited or concerned that their design won’t be everything they had hoped because they’re limited on how much artwork they can have created for them. All of our projects include unlimited artwork, regardless of what type of artwork it is. 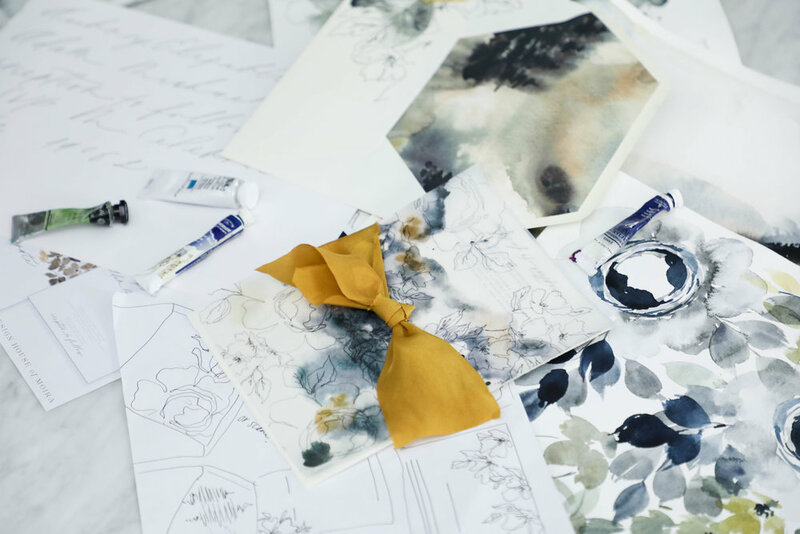 For this suite, we had a watercolor floral pattern, two watercolor wash patterns, a modern landscape piece, and line botanicals. This is the longest portion of our process without contact with our client. 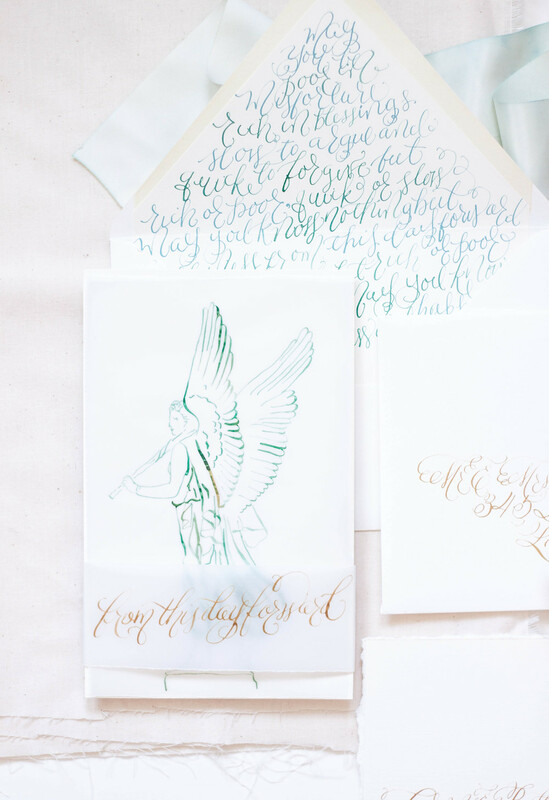 Once they’ve approved the sketch and calligraphy style, we set about creating all the artwork, scanning it into the computer, digitizing the artwork and calligraphy, and getting it ready for their design. 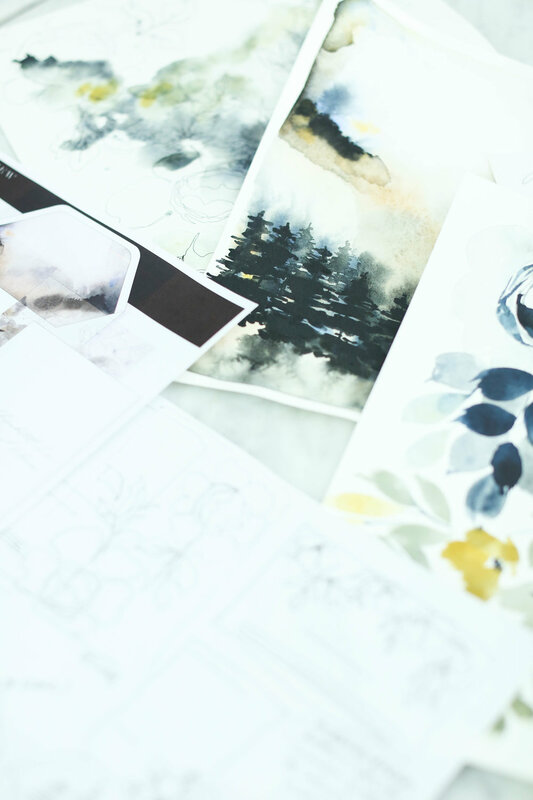 The proof is the next step in the process and is also the next thing the client sees after the sketch (unless they follow us on instagram, in that case, they’ve seen the entire creative process along the way as their design comes to life!). The proofs shows the overall layout of the suite, as well as each individual piece. A proof is usually about 9 pages long, but can get up to 14 if the suite includes several additional pieces. I personally love the proofing point in the process. 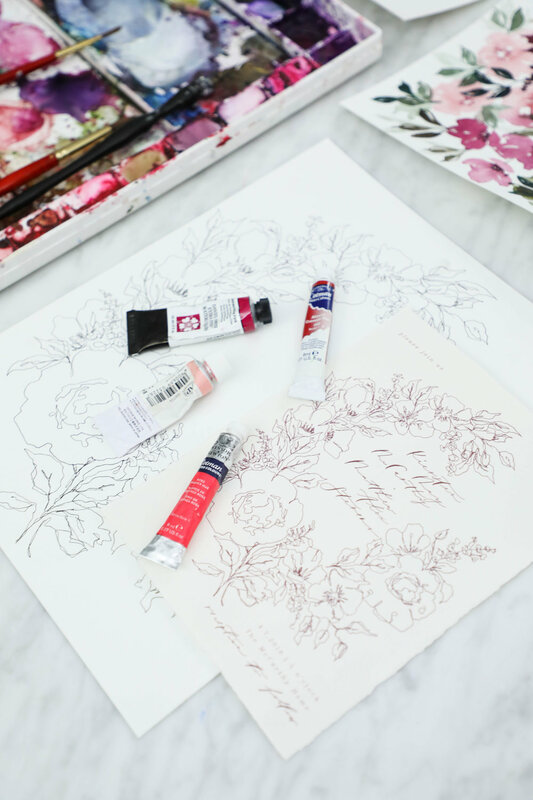 It’s the first point that the client sees their sketch come to life in full color. Similar to artwork, we do not limit how many proofing rounds each client is allowed. We want the design to be perfection, and we’ll tweak it as much as needed. Two to three rounds tends to be the average, so that is how we timeline out the clients project. If more rounds are needed, we always make sure to keep an eye on our mail date, since that will get pushed back based on how long proofing takes. 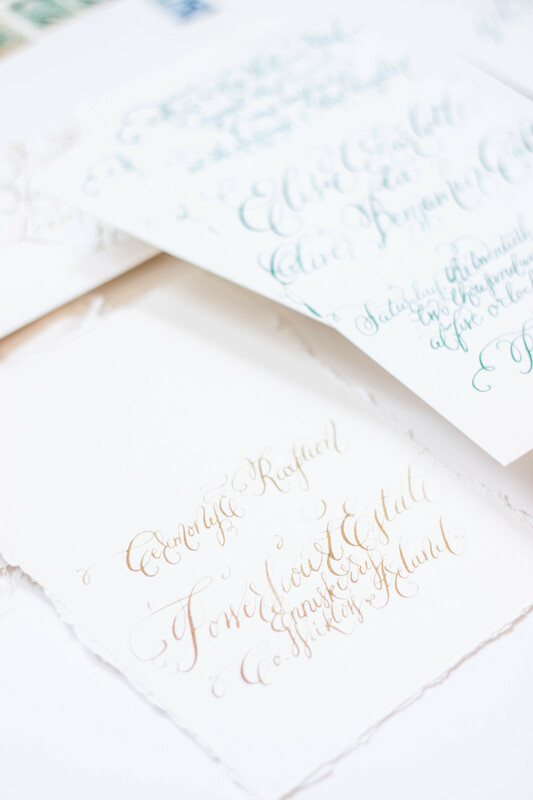 Following the sketch, we create a sheet of lettering and calligraphy samples for our clients to review. We based the styles we provide on the couple’s overall style and the formality of the wedding as well as any personal preferences. 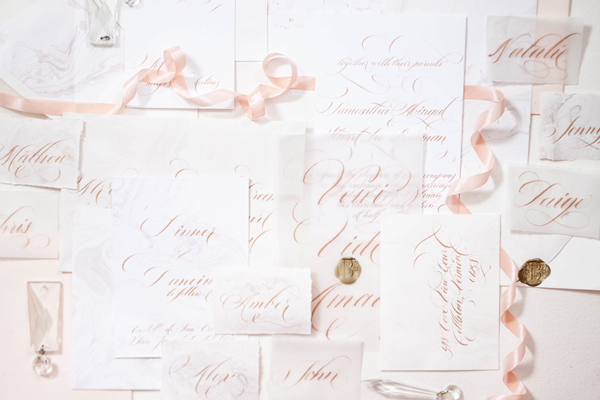 Our calligraphy styles are not a generic sheet we give to each client, but created individually for each project. 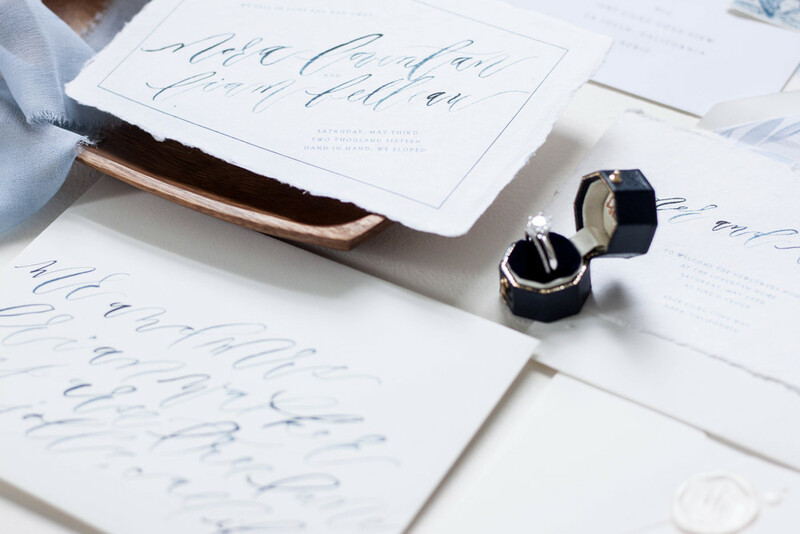 We also prefer to show calligraphy styles shows in the couple’s names, since seeing one’s own name is so much more exciting than seeing a generic style name. 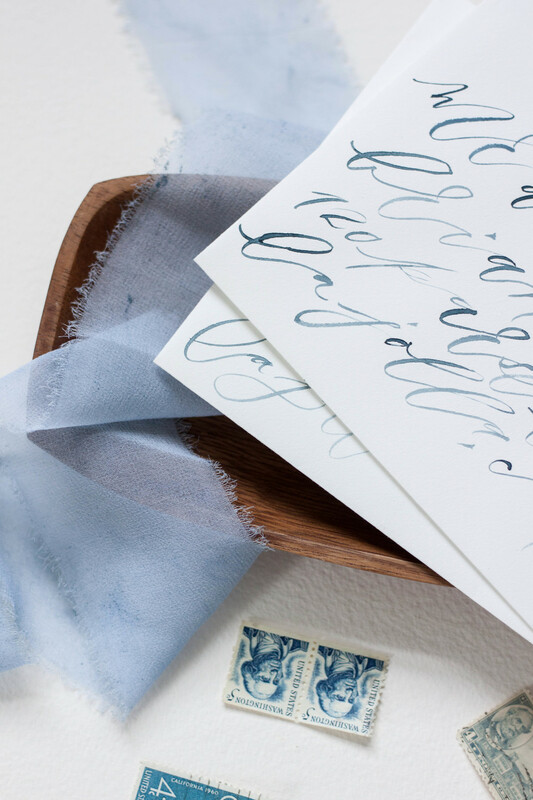 For Aubrey, we created a calligraphy sample sheet with six styles. We knew she preferred minimal and modern, so we showed several variations of that style. Aubrey selected a delicate monoline style for her lettering. We liked the minimal visual impact it had, while still being interesting and unique. Sometimes we nail the style on the first try and sometimes it takes some tweaking. For Aubrey, she loved it right away. 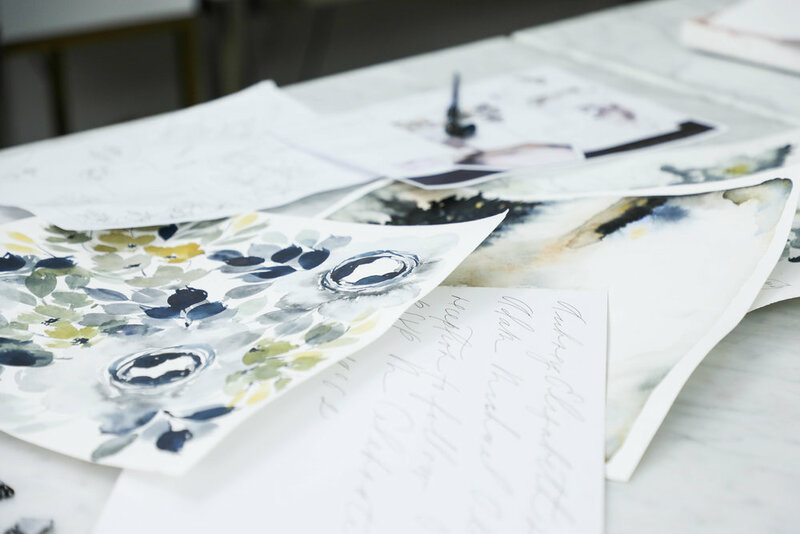 Once we’ve selected the style, the Design House team sits down to see where in the sketch the calligraphy falls and what words or phrases we’ll need for the design. 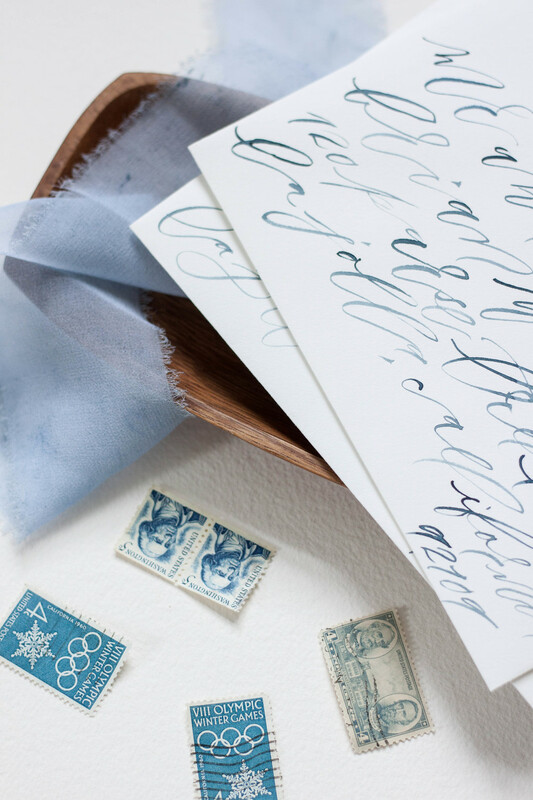 Once we have a list of what needs to be written, we write their lettering or calligraphy out by hand. 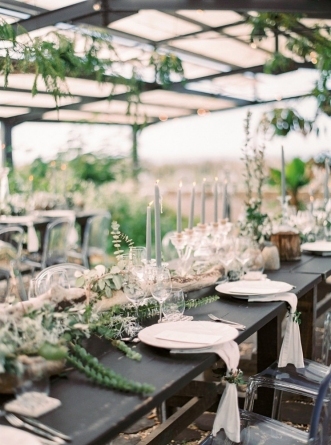 Aubrey and Adam were married at a gorgeous chalet in Courchevel, France and came to us with some specific ideas in mind. They wanted to incorporate ochre into the design, but dit not want the overall look and feel to be summery and cheerful, but moody and modern. 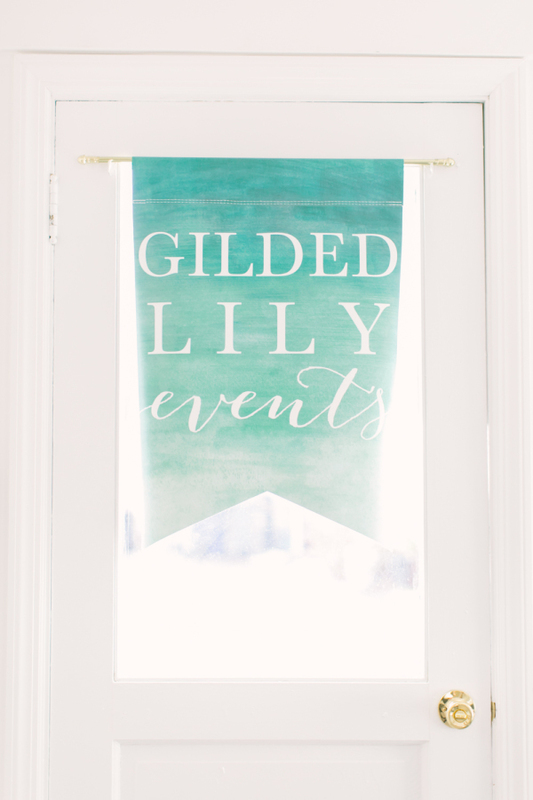 They came to us specifically because of our use of original artwork and lettering designed for each client. 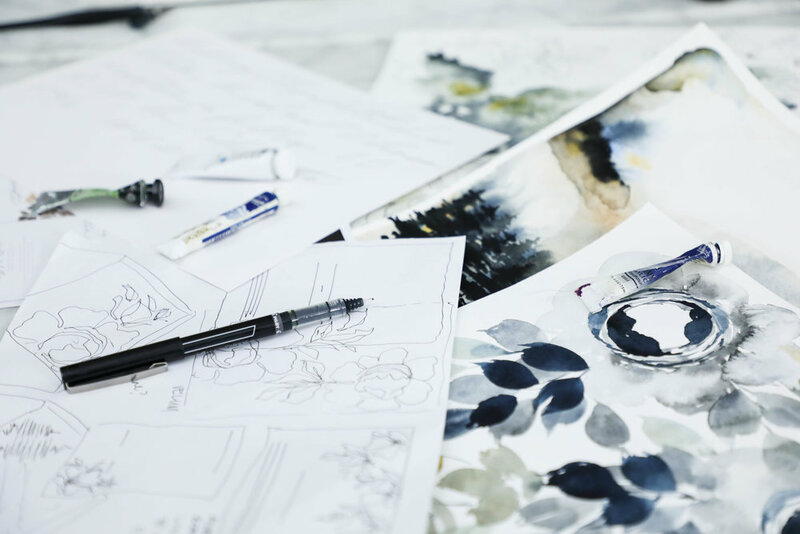 As with all our clients, we began the process with a sketch, detailing out our overall ideas for their suite, mixing media and multiple styles of artwork. It allows the client to visualize how we see the art moving from one piece to another throughout the suite. 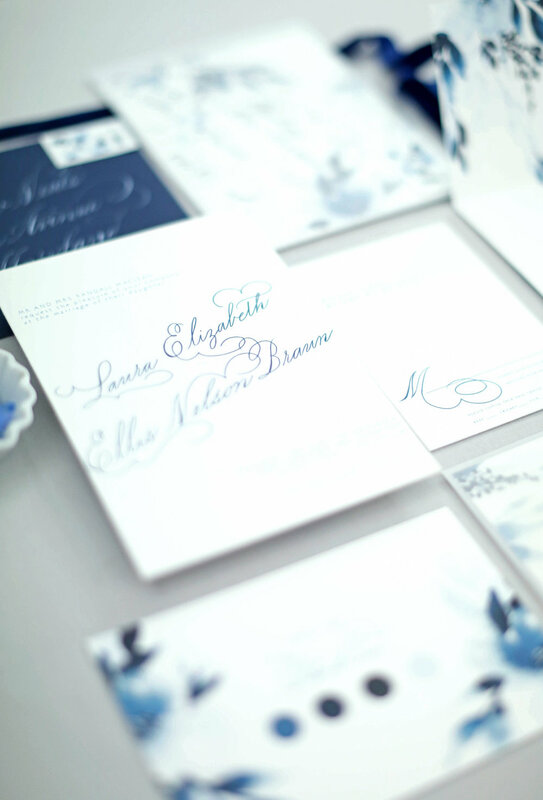 We rarely do pieces that all match exactly, but vary the art across multiple elements of the invitation suite. It creates a point from which we can create and generate all the artwork. As artists and creators, we avoid redoing repetitious work, which consumes a massive amount of time and energy. We want to create your artwork once and do it correctly the first time, rather than missing the mark. This is where the sketch comes in. 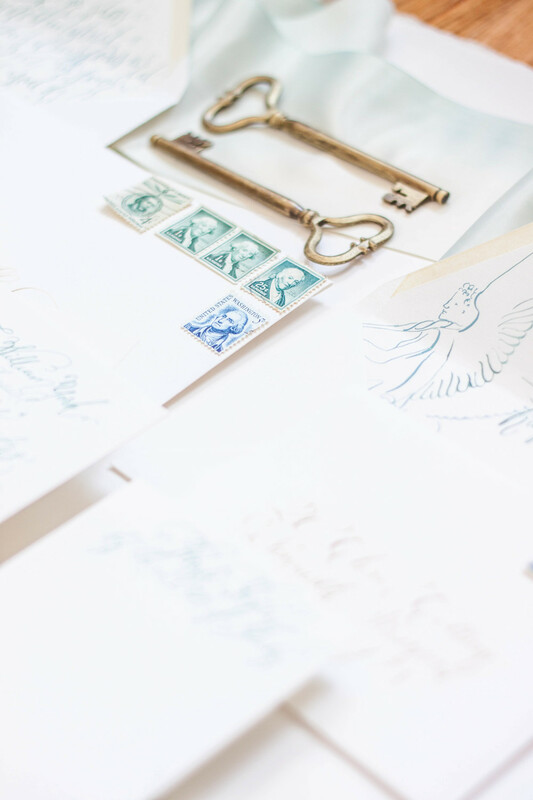 We can make adjustments to the art while the art is still theoretical to allow for more time during the proofing rounds and on assembly details. 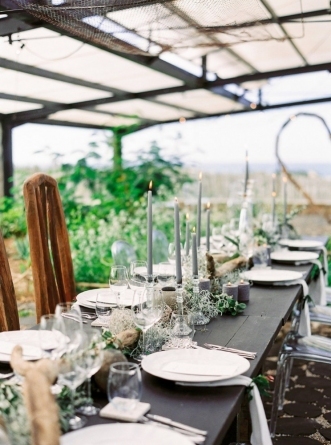 It was our pleasure to create this simple, moody suite for Kristen and Sean's wedding at Areias Do Seixo in A Dos Cunhados, Portugal. 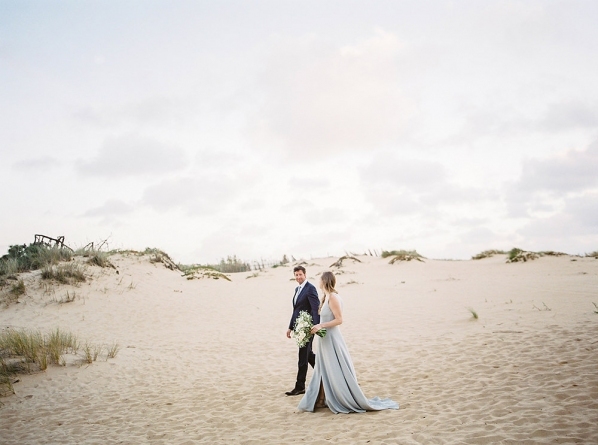 Evoke did an absolutely gorgeous job designing the intimate wedding and Kristen's beautiful pale blue gown was a perfect fit for their destination wedding. 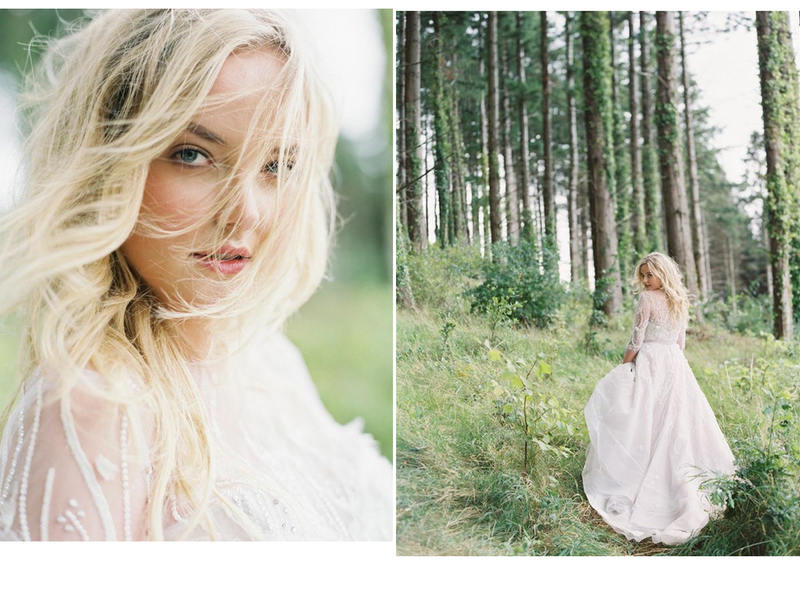 I was so excited to wake up this morning to see Nicole and Mikes gorgeous stable wedding featured on Style Me Pretty! 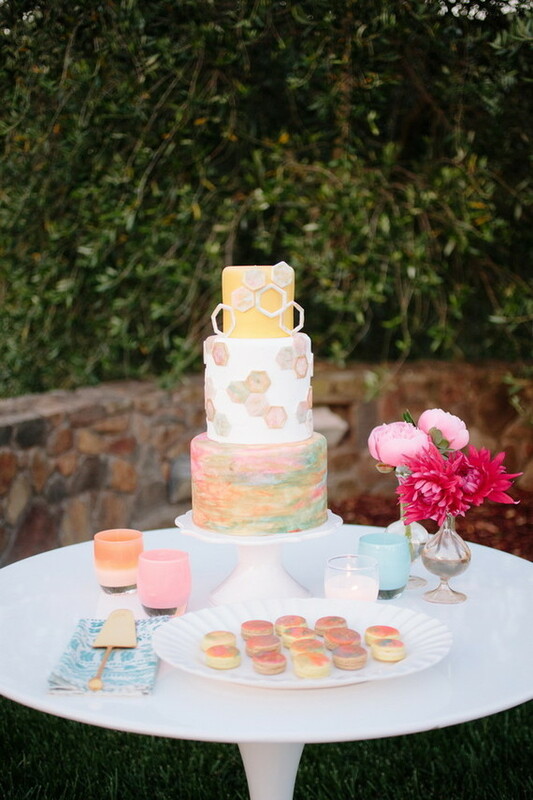 For their wedding, I created hand marbled (yes, each was done by hand!) 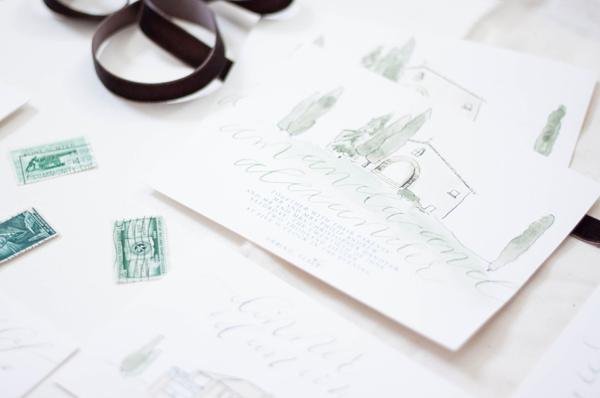 invitations with copper foil printing, a wax seal, and custom hand frayed ribbon. 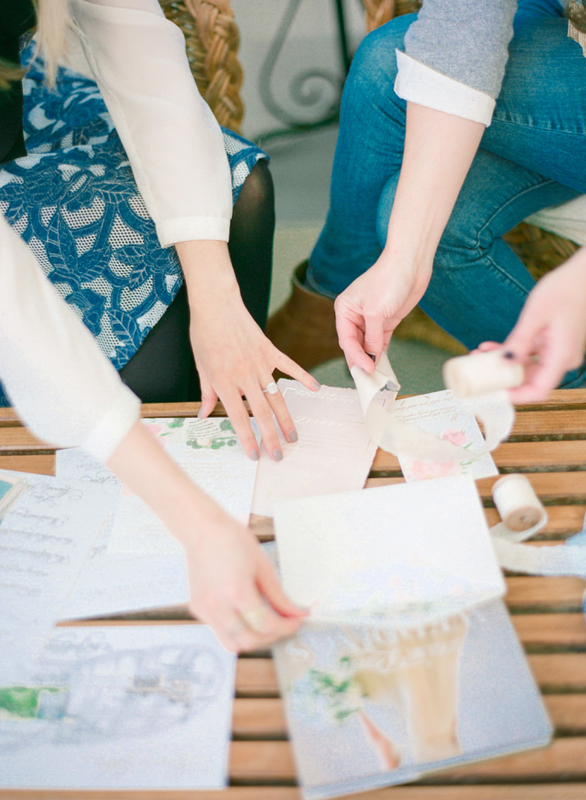 It's Monday morning and I'm greeted by a featured post of my work on Oh So Beautiful Paper! That's a perfect way to start a week! You can view the featured post here! 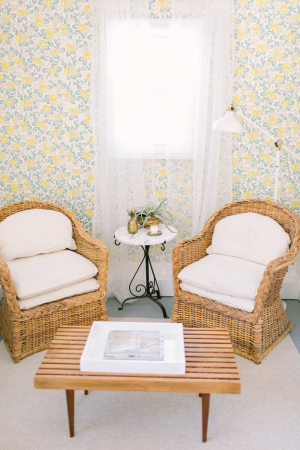 Working with Marina from Bustle Events, we designed this suite for an elopement celebration, using the phrase “we fell in love, so we ran away” as the theme. 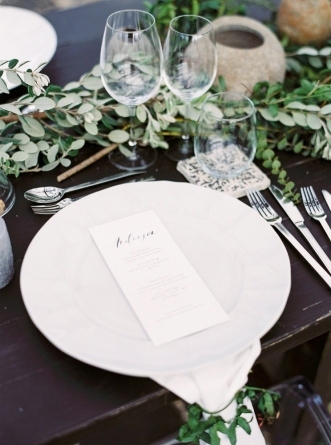 We really wanted to embrace the destination aspect of the celebration, tying in natural edges and shades of blue. 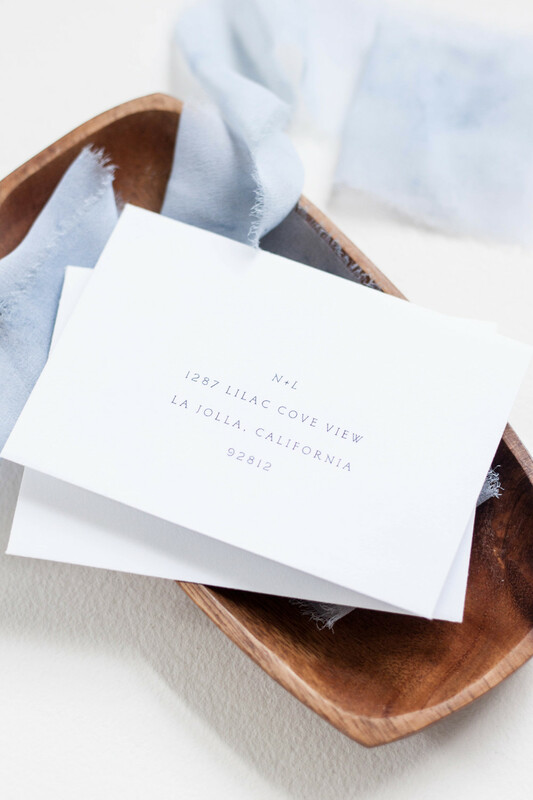 The invitation itself announces their elopement and invites guests to join them at the bride’s parents home upon their return home. 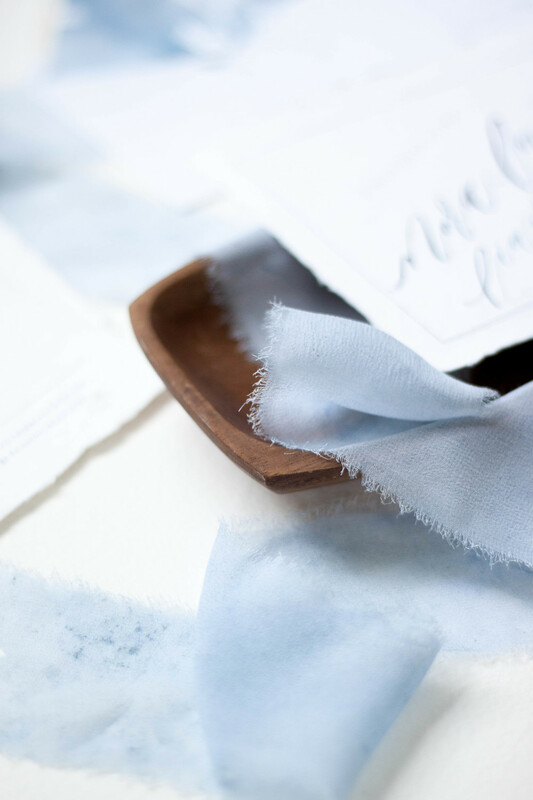 We really loved the idea of using paper with a raw edge and choose to go with handmade 100% cotton rag paper from Fabulous Fancy Pants. 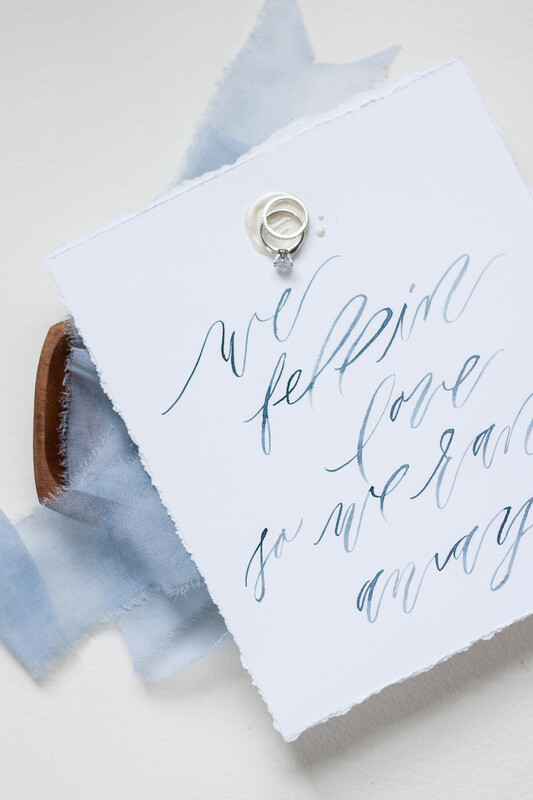 We paired the handmade paper with slooping brush lettering, and paired it with a formal serif font. 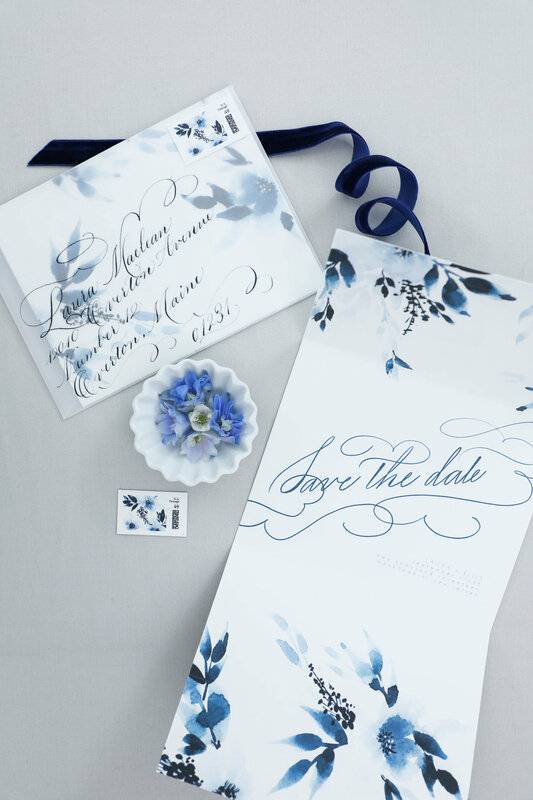 I also hand painted a large piece of artwork for the bride in monochromatic blues, and used that artwork to be printed as their envelope liners. 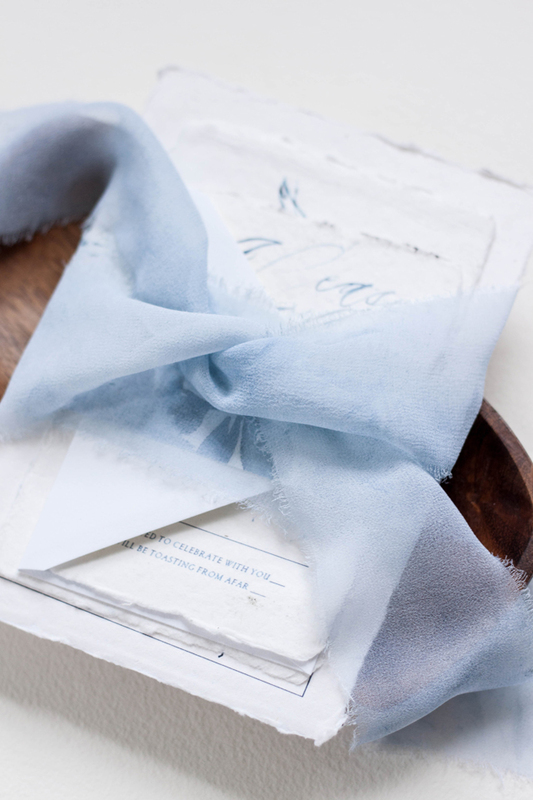 Each invitation suite was wrapped in hand dyed, hand frayed silk ribbon and tucked into a crisp white cotton envelope. 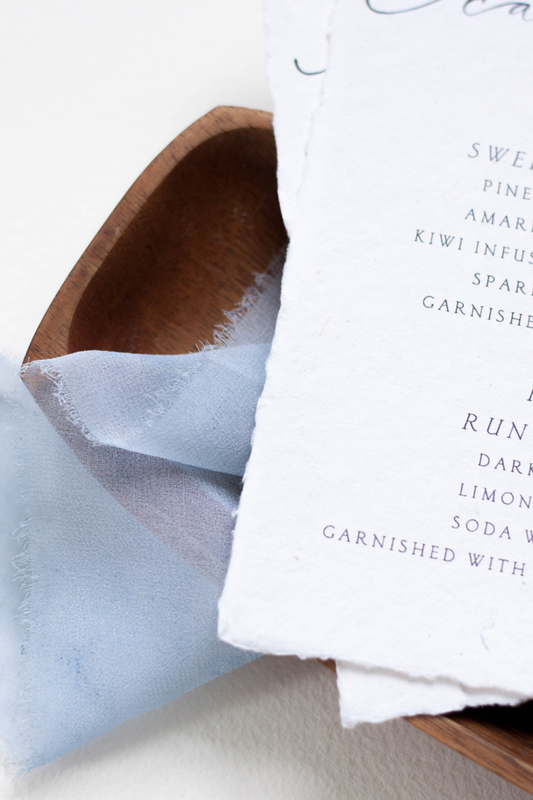 The cocktail menus were printed on the same 100% cotton rag paper and featured a “his & hers” signature cocktail. We also created a larger scale artwork piece of the quote we used in the suite featuring the couple’s wax seal. 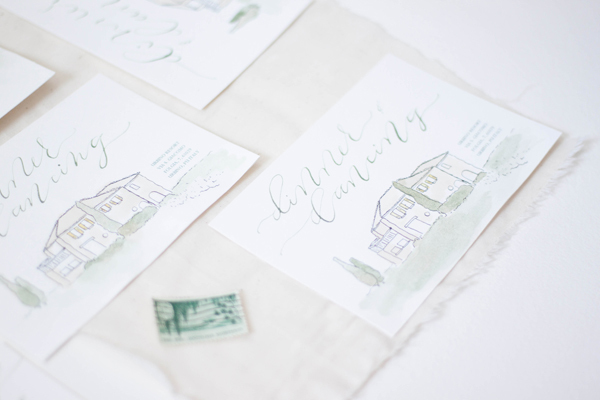 These invitations were created for the Oh So Inspired Retreat held in Sonoma, California last fall. 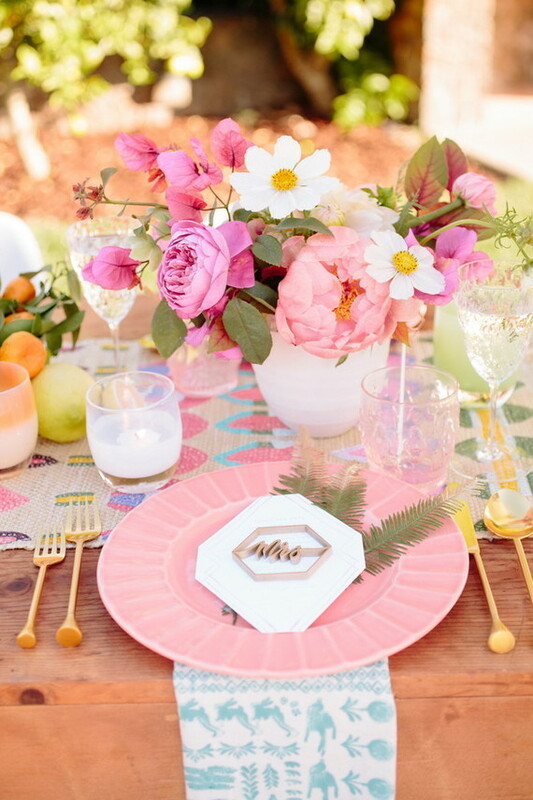 We wanted to create something fun, bright, bold and playful with touches of rose gold and shades of peaches and pinks. 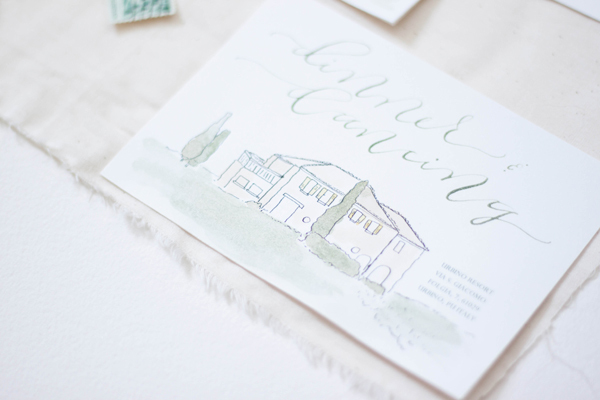 The invitations were kept on the simple side, with bold lettering gracing the front. 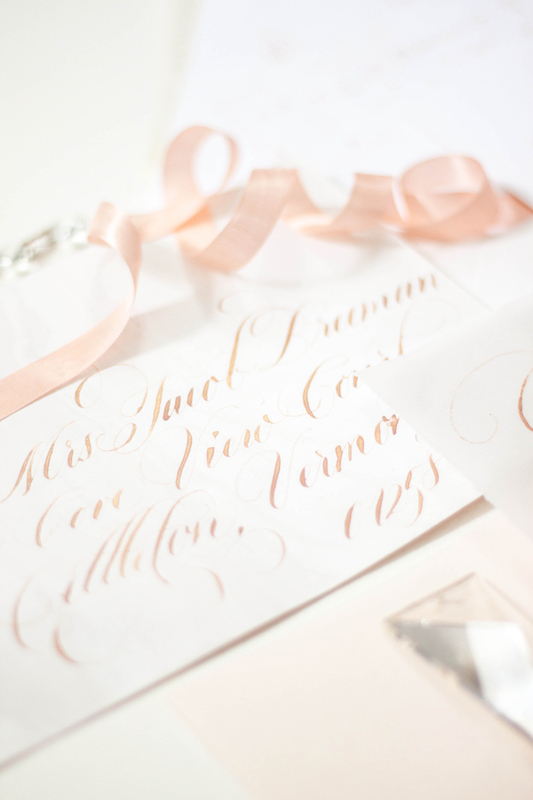 Behind the lettering, I did a pale watercolor wash of pale pink and dropped in just a touch of rose gold. 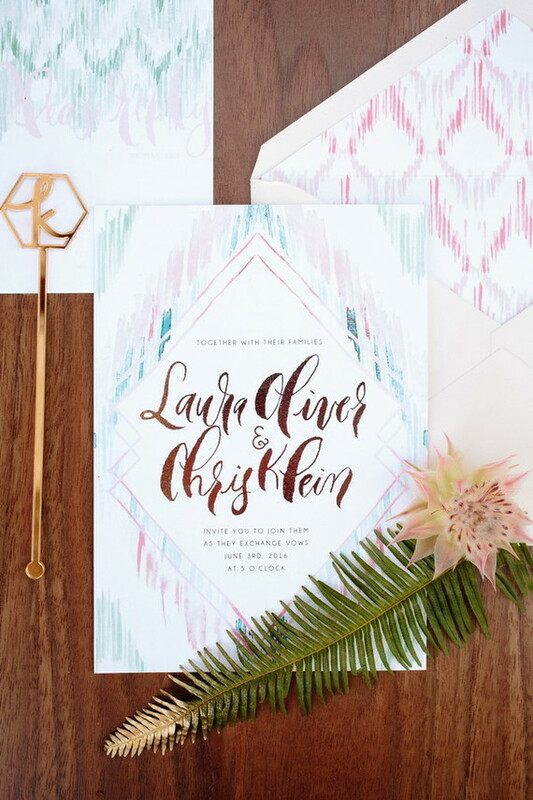 The backs of the invitations were printed in the bold pattern, adding interest and color to the simple invitation design. 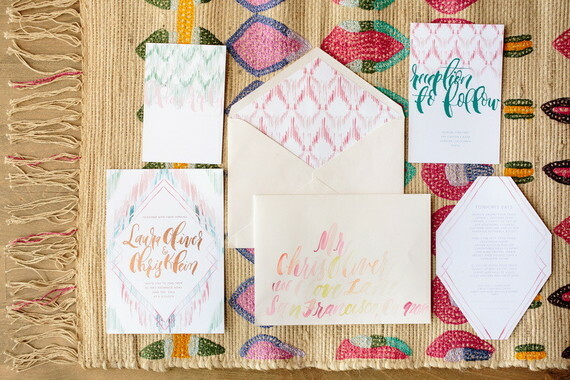 I completely love the envelope design with the envelopes lined in the bold print. 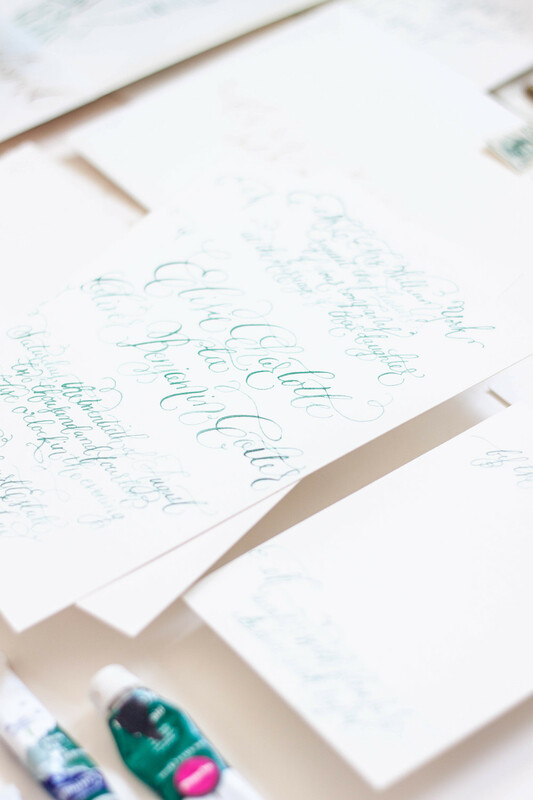 Each envelope was addressed in the same bold, heavy brush lettering. 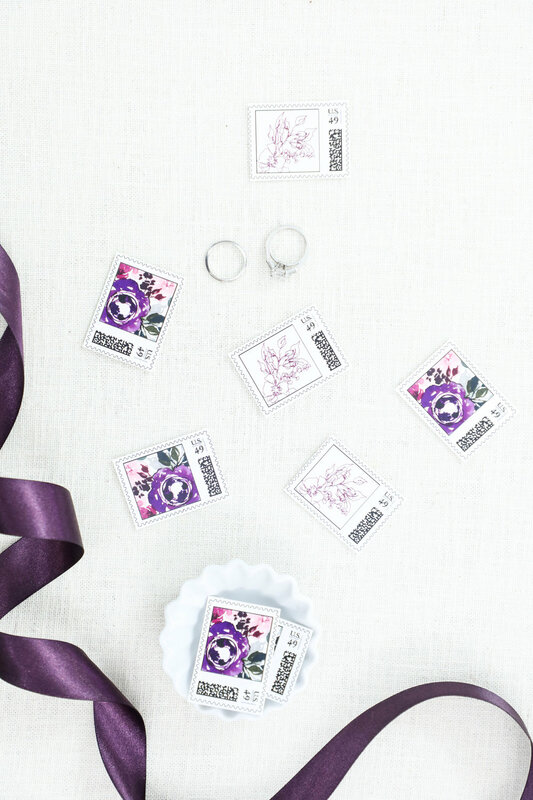 The carefully selected stamps are reprints of vintage seed packets and the colors were perfect! 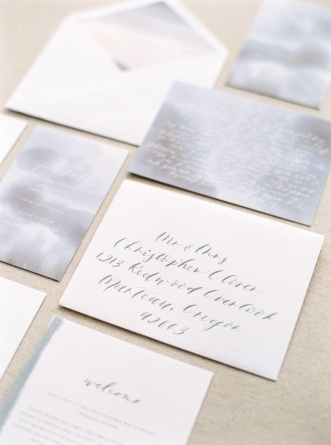 The small reply card was printed with the couple's address with their initials in the same bold brush style. When you run away and get married in Italy trailing your entire family and group of friends with you, you might as well go big. 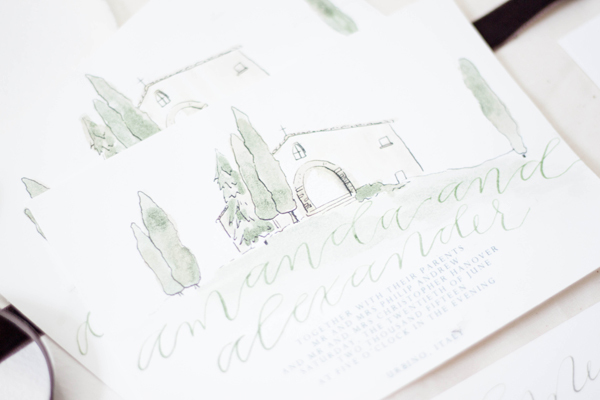 We created these invitations to reflect the amazing venue, complete with cypress trees, old masonry and yellow shutters. 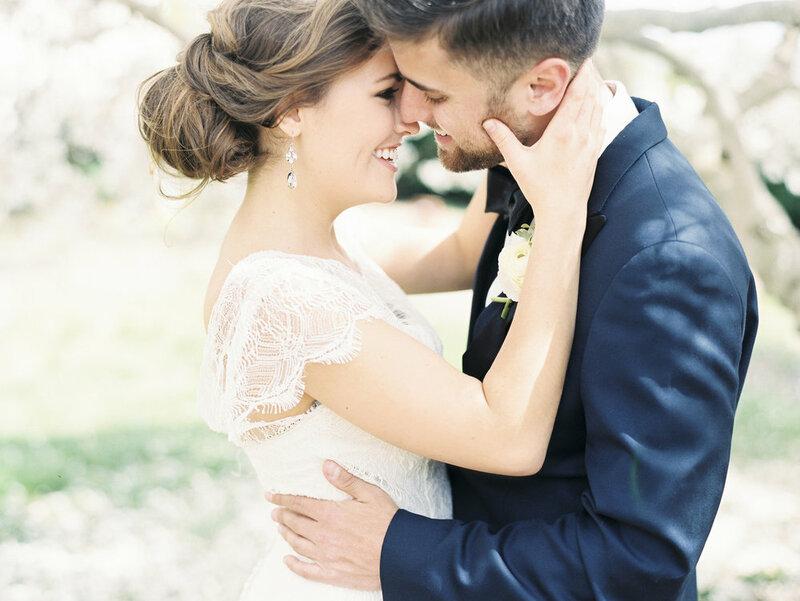 There are plenty of ways to showcase your personality on your wedding day, but what elements are the most important? I truly believe that love is in the details. However, couples can easily get weighed down by all of these “little” things. 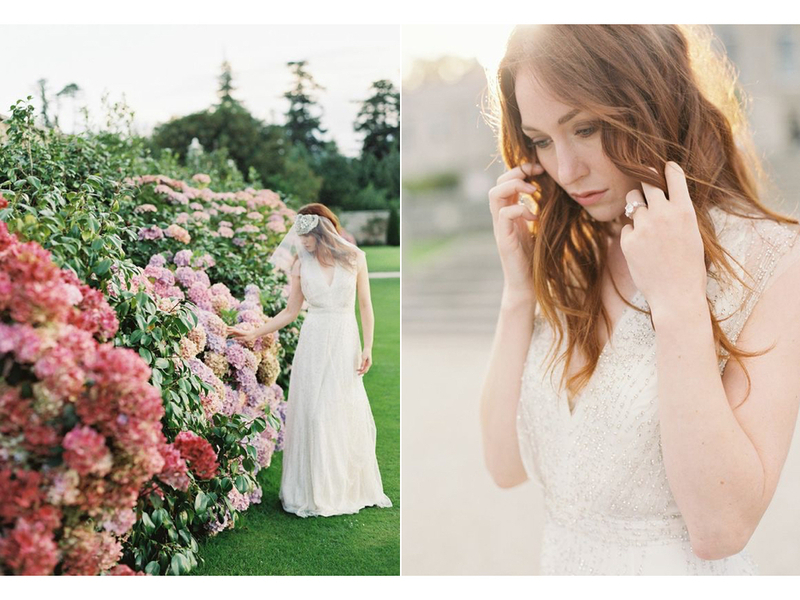 I like to remind brides-to-be that it is important to really zoom in on the areas that will make the most impact. If you think back on a picture of a wedding that you loved, you probably didn’t notice everything that was going on around it. Focus on what is the most important and highlight it. 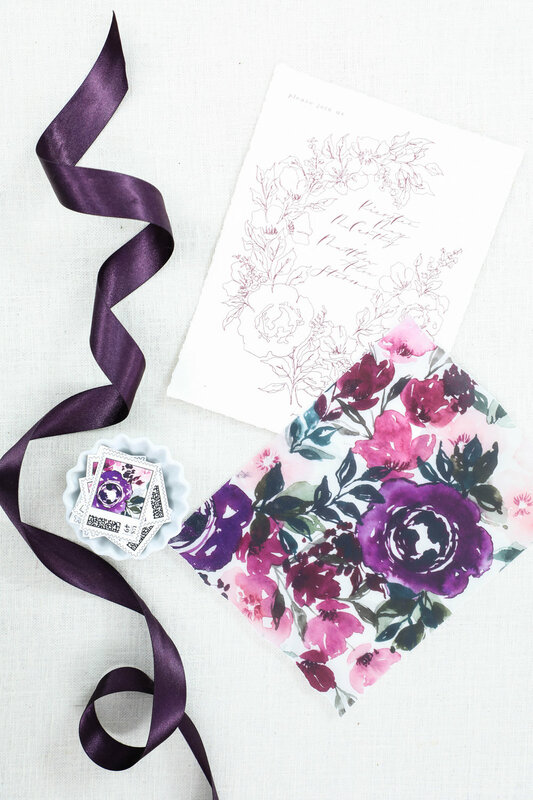 For an overall beautiful, cohesive look, I believe the flowers and paper goods are the most important elements. 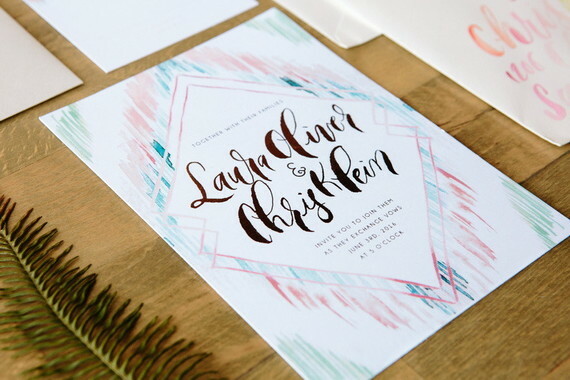 They carry the wedding day story and are usually the first and last thing that your guests will take note of. 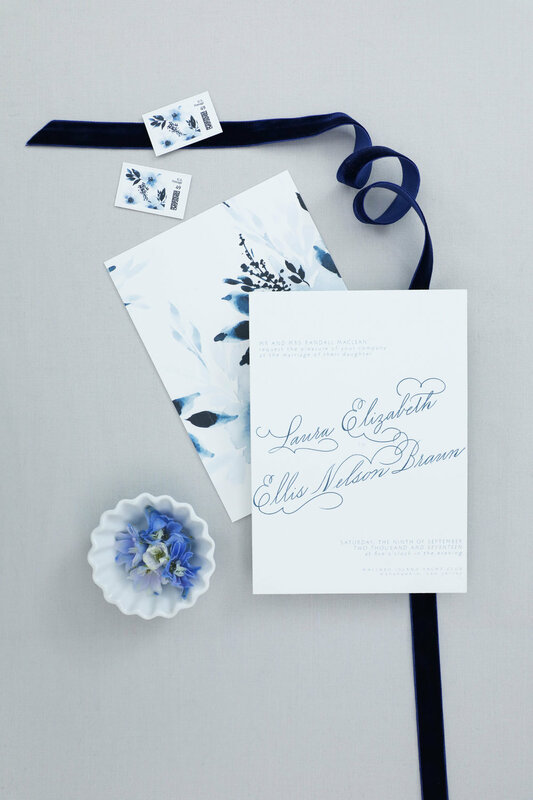 Invitations are the guests’ first peek at the formality of the wedding along with the type of event being thrown. 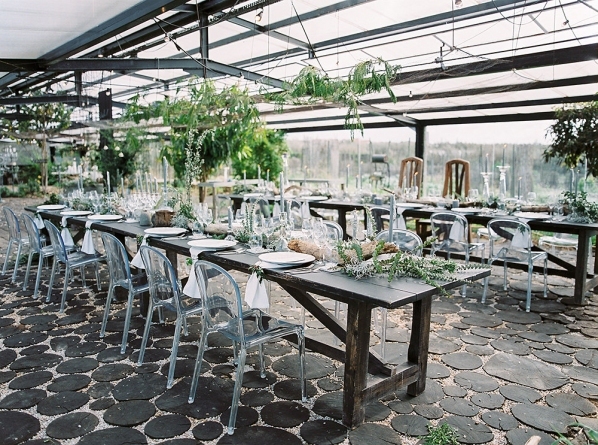 How can brides keep them creative, yet cohesive? 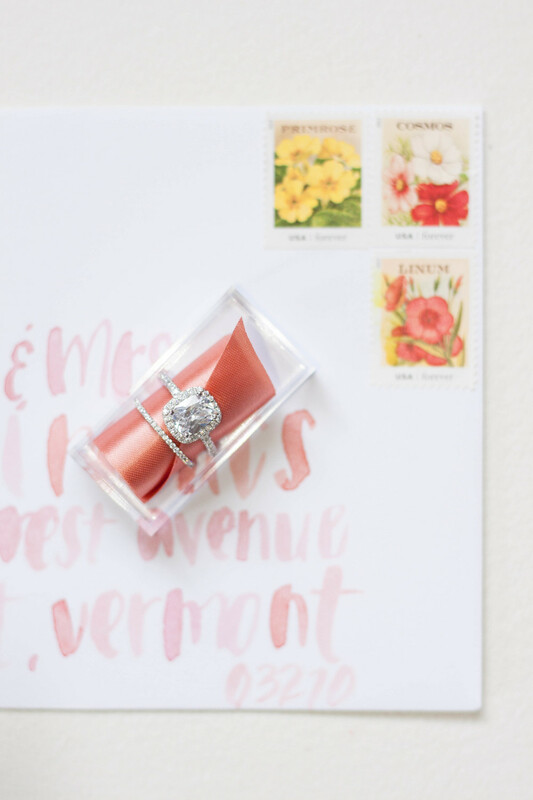 Save the Dates and invitations are the first connections that your guests will have with your wedding and it sets the tone for what to expect for your day. 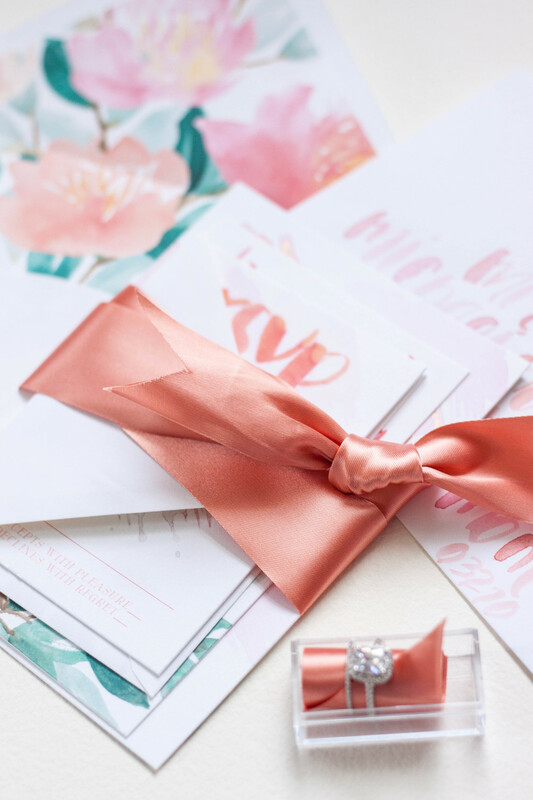 Before you send out your invitations, make sure you have a good idea of the color palette and key design elements that you are going to use throughout your wedding day. 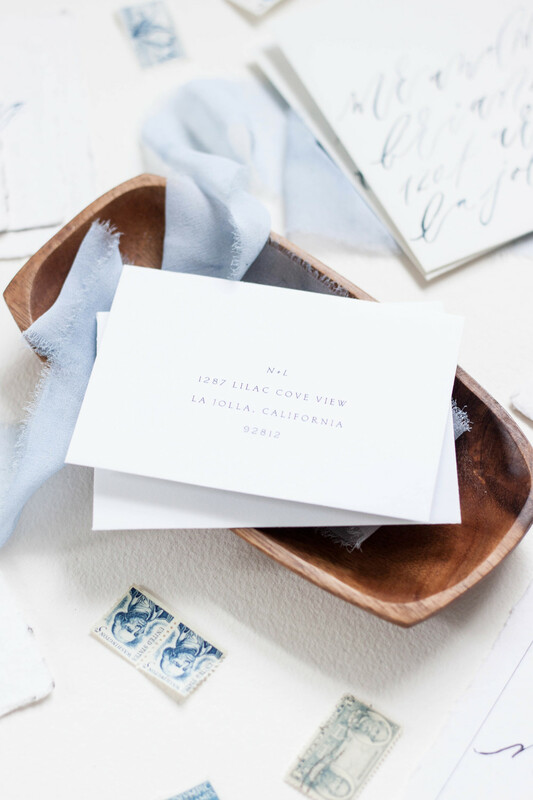 Custom invitations are the way to go and are not just a luxury item. 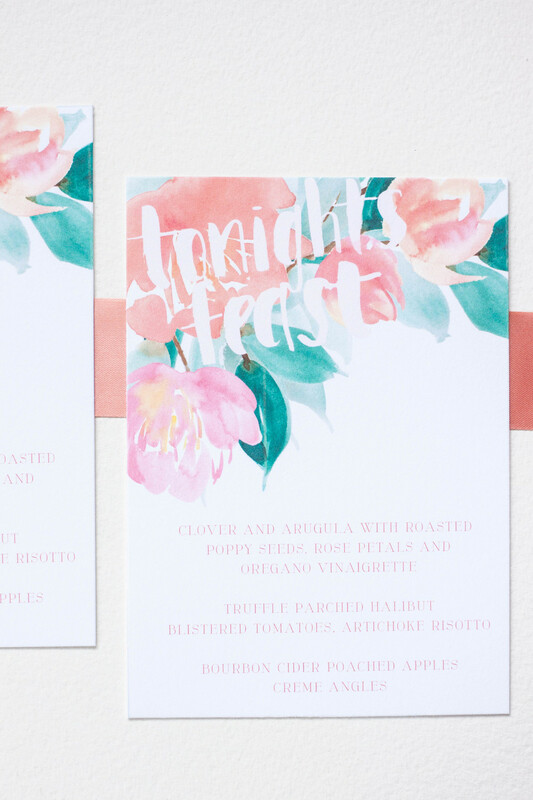 Be clear with your graphic designer or artist of what you want and how they can work within your budget to make your invitation dreams come true. Check out more from Paige on Style Me Pretty! I've been pretty obsessed with marbling lately, and this suite is nothing short of all sorts of marbled goodness. Gold engraved lettering, pale silk ribbon, and marbling in shades of grey, it just doesn't get any better! The entire suite was topped off with a gold wax seal, bringing in formality and tradition. 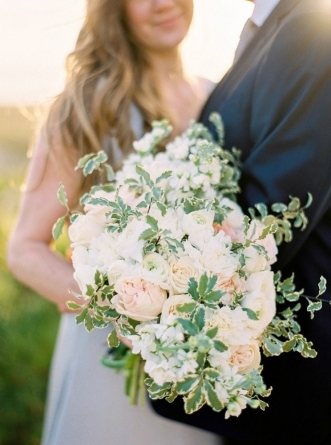 see more from this gorgeous suite in the full gallery. 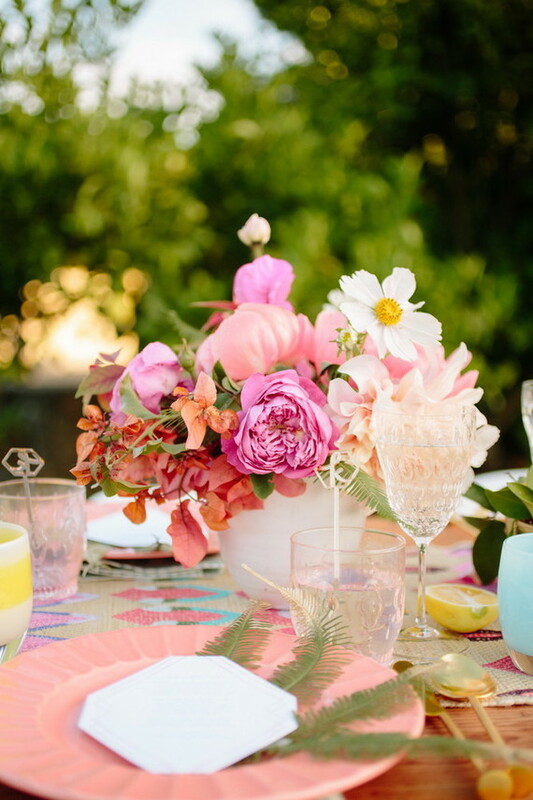 A destination affair with Strawberry Milk Events, Laura Gordon and Engaged! 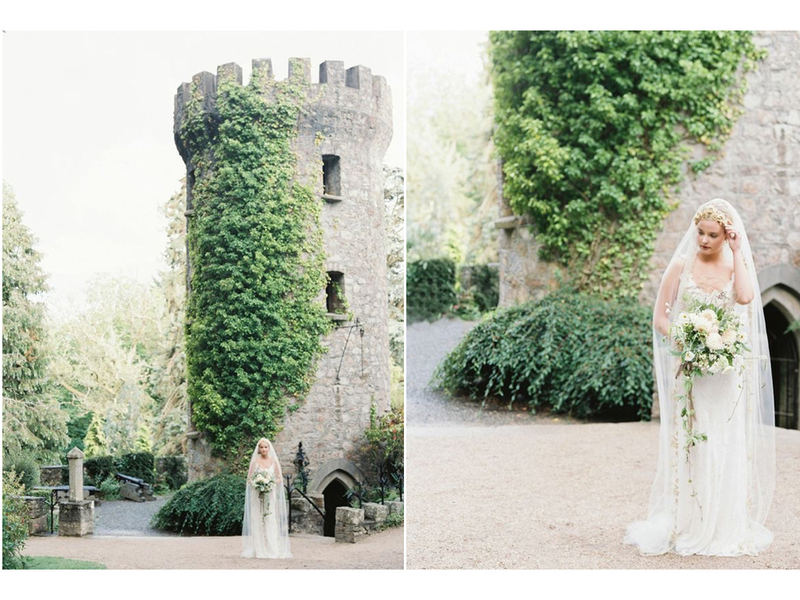 Magazine in the Emerald Aisle produced some really dreamy images! 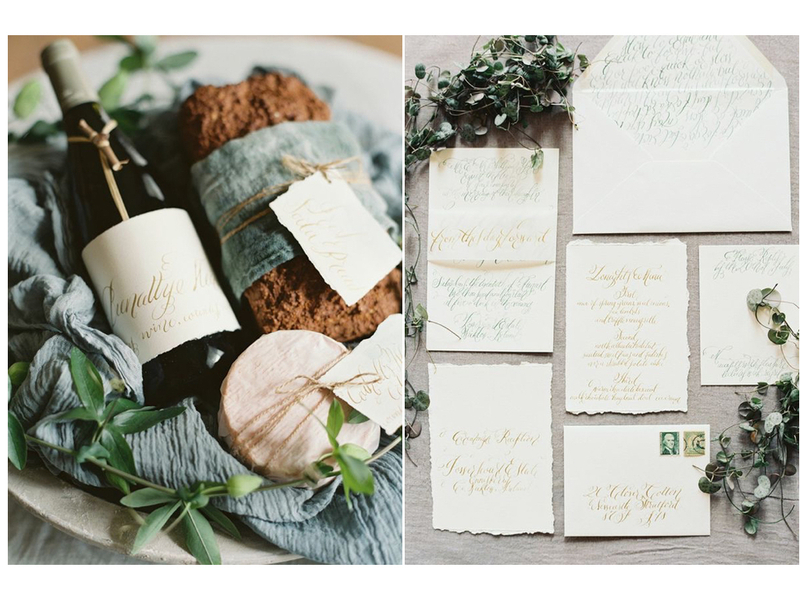 I had the pleasure of collaborating with these lovely ladies on a gorgeous invitation suite, featuring lots of calligraphy, gold and teal foil printing, custom wine bottle labels and tags, and vintage postage. Check out the full magazine feature here! So I'm a little behind in showcasing some of the features I've had the pleasure of working with. Ok, a lot behind. Later this week, I have the full feature from Engaged! 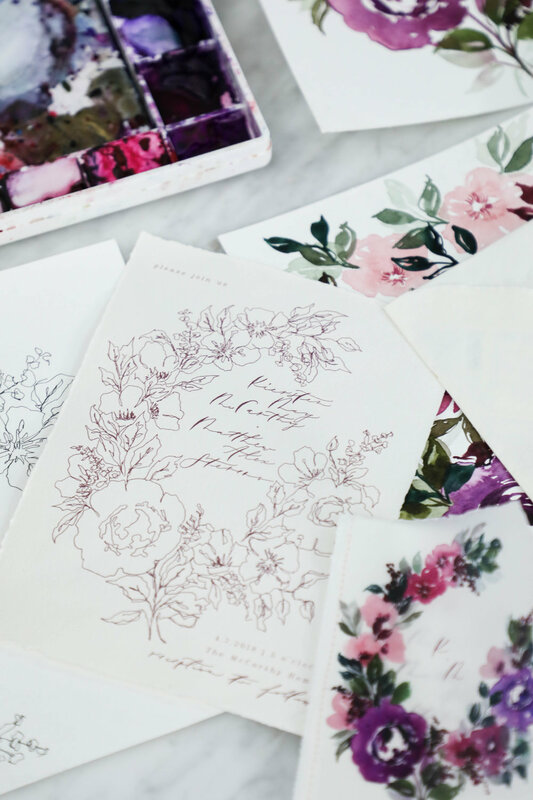 Magazine featuring this invitation suite, but for now we'll take a look at some of the paper details! 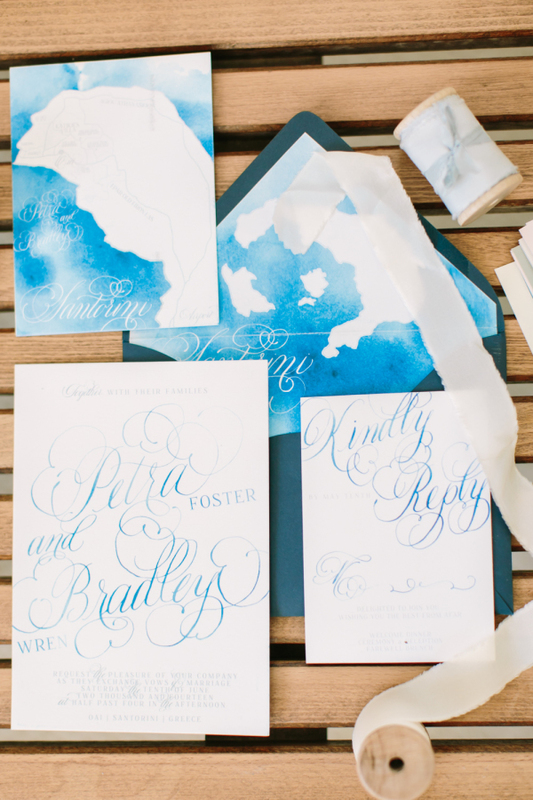 The suite is foil printed in a pale antique gold and teal on cotton paper with deckled edges. We alternated the colors on each piece, keeping the overall look balanced. 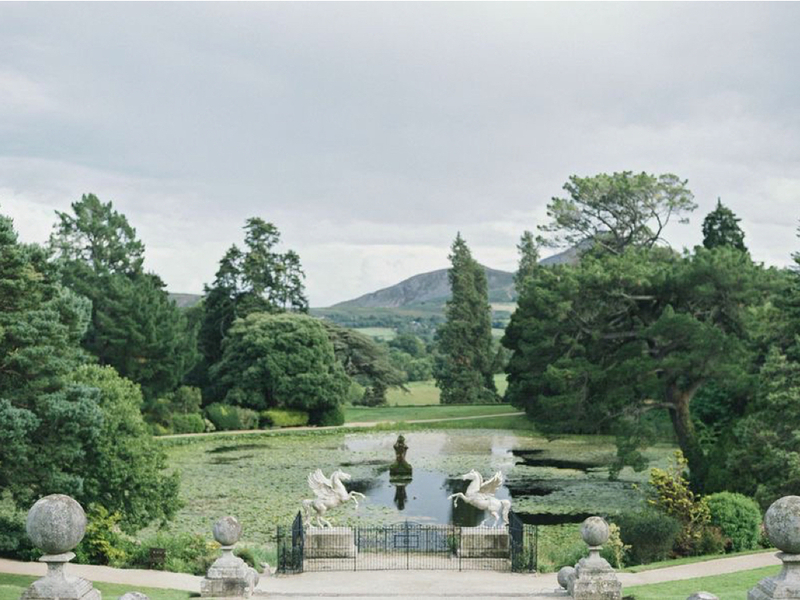 The final suite was stacked up and topped with a thin piece of velum with an illustrated angel, a statue featured at the castle. The whole thing was then wrapped with a thin piece of parchment reading "from this day forward." I also created tags for the guest welcome baskets and custom wine labels to follow the same design. 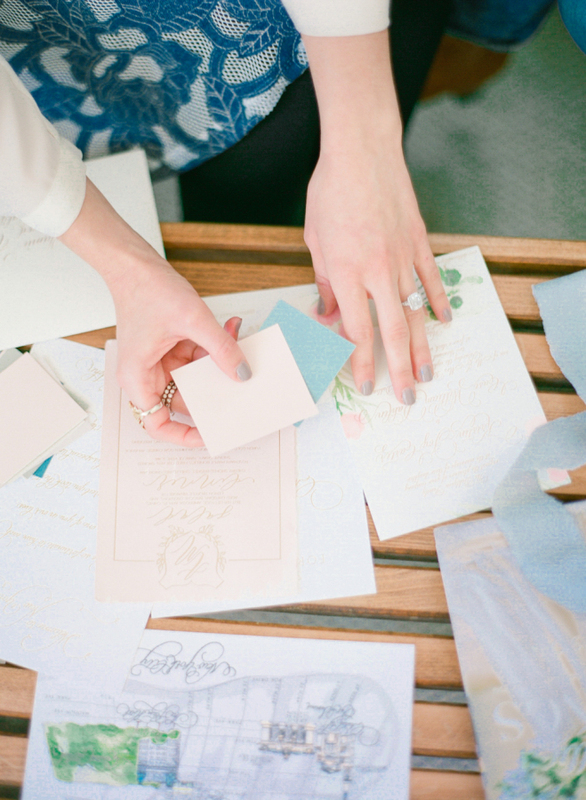 The place cards also featured deckled edges and gold ink. Stay tuned this week to see the whole feature from the magazine! First photo from the lovely Laura Gordon. From our amazing photographer on the project, Cadence Kennedy, "As an artist and photographer, I am constantly inspired by color, light and art. 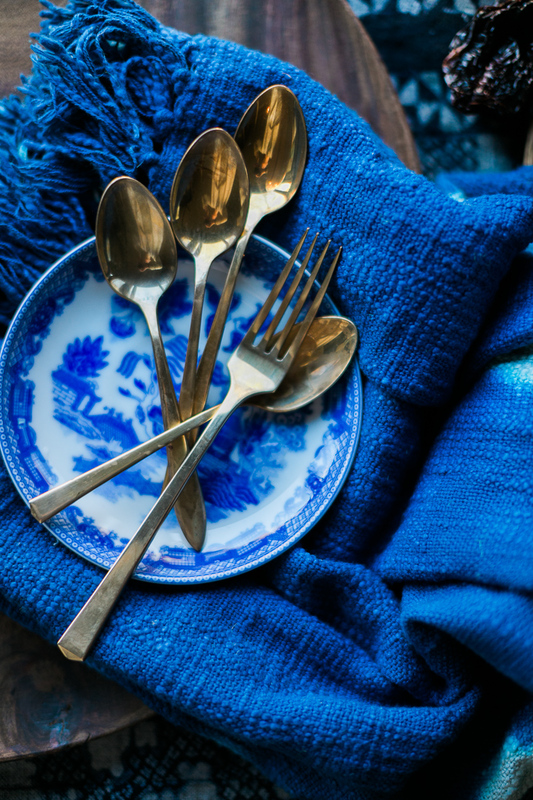 I started dreaming of an "indigo" inspired styled shoot after learning of "Cyanotypes" a few years back. Cyanotypes are deep blue photographic prints which originated during the 1800's. They are created by laying botanicals or objects on top of light sensitive paper, exposed to the sun, then developed." ...inspired by the still life painting of the old masters full of dramatic colors and gorgeous, light textures. 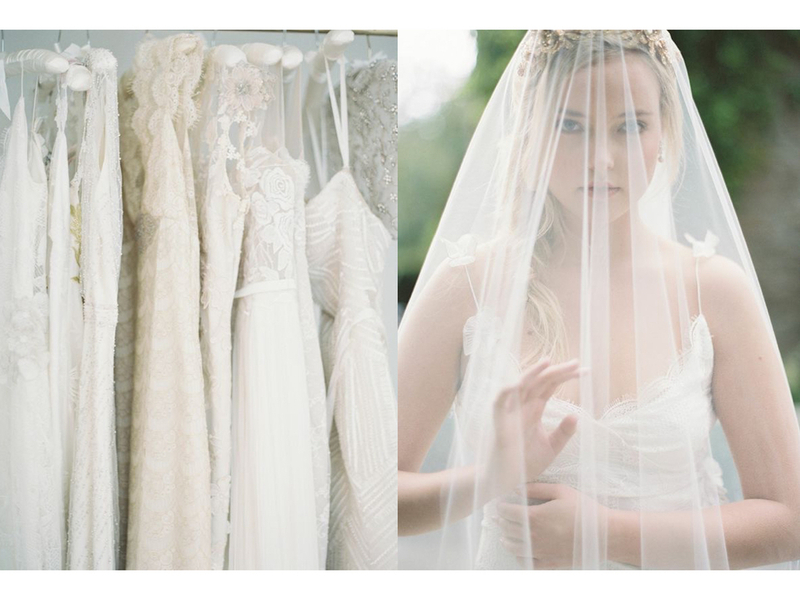 The photography for this project was so lovely, light and airy; I just fell in love with the finished images! 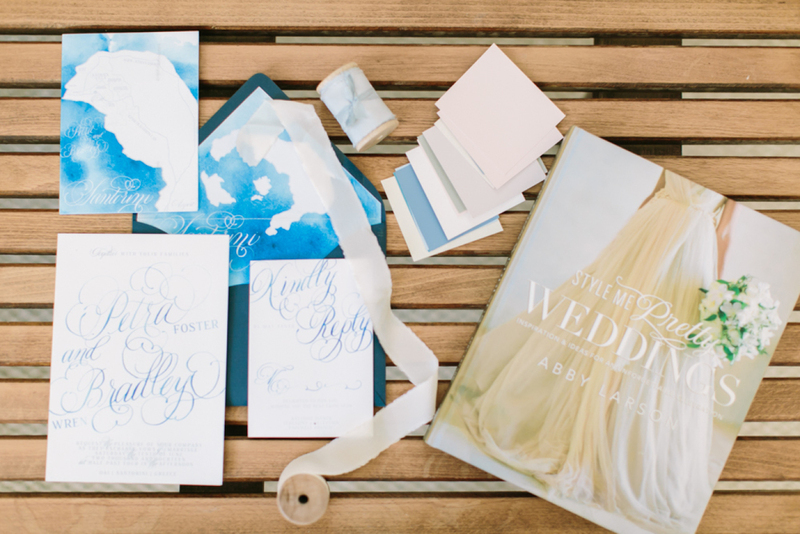 the invitation for this suite included taupe watercolor with gold foil. 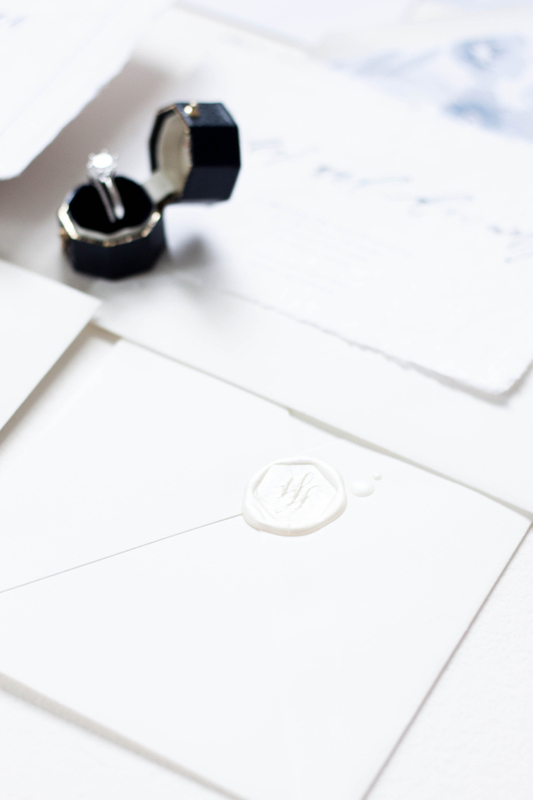 the invitation was topped with a crested monogram and surrounded by a border. I loved combining the contemporary watercolor with the moody colors. 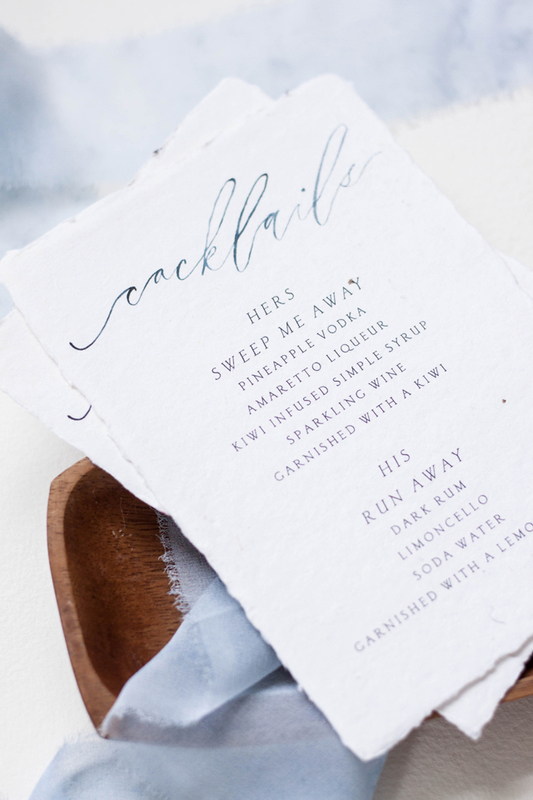 The invitation was layered with a deckled edge velum with the "ever mine" quote on it. The entire suite was wrapped in a raw edged linen with a matching monogram.